A Royal Enfield dealer in Wisconsin just received its 2010 C5 motorcycles. It posted some interesting pictures showing the unpacking process. 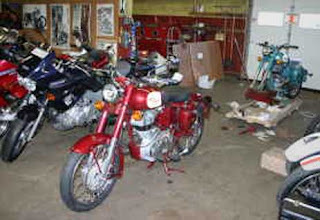 S-K Service is the Royal Enfield dealer in Hatley, Wis. Hatley is in Central Wisconsin, just east of Wausau. Lots of "blue" roads in the neighborhood must make for great motorcycling. "2010Royal Enfield C5's are in!!!" S-K's CraigsList ad enthuses. 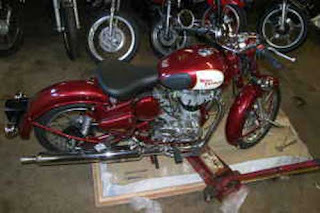 "We have received our first two 2010 Royal Enfield C5's: one red/creme, one blue/creme. Come and see these fuel injected beauties." "S-K Service is far from the glossy, high pressure, corporate sales machines passed off today as 'motorcycle shops.' S-K service has operated from the same location in Hatley, Wisconsin since 1984 by owner, mechanic and AMA pro level flat track racer Steve Kasten. 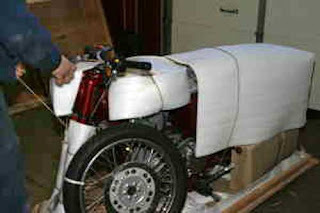 "S-K Service is owned and staffed by lifelong motorcycle enthusiasts; not corporate salesmen. We've been there and done that. Steve also has a fine collection of several significant Japanese and European models from the 1970s, '80s and '90s awaiting display in an anticipated museum." S-K Service at 100 Clark St., Hatley is open 10 a.m. to 6 p.m. Monday through Friday, 10-to-2 on Saturday and is closed Sunday. Telephone is (715) 446-2225. I could not stop listening to the bullet sound posted on S-K's website!